A bomb has exploded in a church in Tanta Egypt, killing at least 27 and injuring dozens more. The huge explosion took place at St George’s Coptic church in Tanta, in the Nile Delta, north of Cairo on Palm Sunday, one of the holiest dates in the Christian calendar. 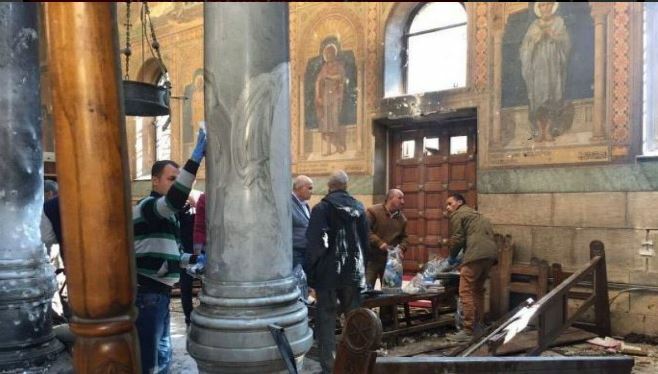 The blast went off as Coptic Christians were celebrating the holy day, marking the week before Easter and Jesus’s entrance into Jerusalem according to their beliefs, the BBC reports. The cause of the explosion is not known, but the county’s Christian minority have been targeted by Islamist militants over the last few years. Last December, 25 people were sadly killed when a bomb went off in the Coptic cathedral in Cairo and on April 1st, 16 poeple wre killed after an explosion near a police training centre, also in Tanta. Since 2013, violence against these Christians has been on the increase, especially after the military succeeded in overthrowing the president and proceeded to crack down on ISIS. Thoughts are with those affected by this dreadful incident and the families of those killed and injured.